You may have recently seen her on stage playing a lead part in the Royal Palm Players production of “Don’t Drink the Water,” but if you didn’t catch it, you’re sure to see Lynda Grant regularly around town at some function or event. Lynda and her husband, Jim, played the lead roles in the February production. Working with director Tad Ingram, she started doing rehearsals on January 15, and the play started the first week of February. “We rehearsed every single day for four hours, and of course, even more toward the end. It was hard work. But you get to see the play unfolding and the characters in their true form,” she said. Lynda didn’t have much background in performing arts, although she did sing in a country-rock band with her sisters to raise charity funds for a church. She actually stumbled upon acting by accident, when she was accompanying Jim to a performance and the director asked her to read some lines. Lynda had been a part of the chorus in “Oklahoma,” but this was her first real role as part of the cast. When she’s not on the stage, she serves on three committees for the Friends of the Boca Grande Community Center. 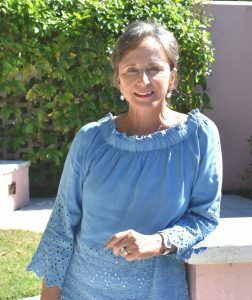 She helps with organizing the “All that Jazz” events on the island, the “Travel Club” and the more recent “The Finer Things” club, which is a group of residents who orchestrate day trips and presentations on the island. She is also on the board of birectors for the Barrier Island Parks Society and was the auction chair of the annual Green Gala event, the biggest BIPS fundraiser event of the year. About 330 people attended the gala this year. She’s been a part of the BIPS organization for about six years. Jim was president of BIPS for nine years, and Lynda worked on the Green Gala committee during those years. She became a director on the board about three years ago. Although the annual fundraiser just finished, she’s already signed up to be the auction chair at the 2019 Green Gala. BIPS promoted the May Giving Challenge campaign at the event, in which the Community Foundation of Sarasota will match every $100 donation. For those who wish to contribute, visit thegivingpartner.org. Lynda said the campaign for the Gasparilla Island Range Light renovations really put BIPS on the map. Lynda is originally from Chicago, Illinois. After graduating from high school, she attended Barat College of the Sacred Heart, a small school in Lake Forest, Illinois, and studied liberal arts. Her graduating class had 90 females. As a college graduate, she found a job as a paralegal. A few years later, one of the men she worked for moved to San Francisco to accept a job in the winery business, and he needed help, so he invited Linda to come and work with him. Against her parent’s wishes, the free-spirited 20-something jumped at the opportunity and relocated to California. After five years, she moved back to Chicago to be closer to her family, and she accepted a job at the First National Bank of Chicago. After that she worked for a small bank, and eventually for McKinsey & Company in financial services. After that, Lynda received a job offer as vice president of private banking for NBD Illinois. She met Jim while she was working as a private banker. After the party, Jim never called her, but it turned out he didn’t have her phone number. Two years passed, and they ran into each other again at a business function. The rest is history. Jim worked for NBD Bancorp in Chicago, and after they were married, he received a transfer to Michigan. He was head of marketing for the bank, so they did a good amount of traveling during that time. “He’s a great speaker, and we got to meet a lot of wonderful people and see the world,” Lynda said. They lived in Bloomfield Hills, a suburb north of Detroit, for six years before returning to their hometown of Chicago. Lynda and Jim have been coming to Boca Grande for about 15 years. They were introduced to the island through Jim’s aunt, who had a place at the Boca Grande Club. They purchased a home in Boca Grande about 11 years ago. Lynda is the oldest of five children. Her brother, Mark, lives in California and is in the commercial music industry. Her sisters Pamela, Mary Beth and GiGi all live in the Chicago area. She has one grandson, Mason Grant, who is currently in college and lives in Fort Myers. When she is not working, she enjoys knitting and noncompetitive golf. Lynda and Jim will be participating in the upcoming Hank Wright Memorial Golf Tournament fundraiser. She also is a fan of music, all kinds, but mainly country. On top of all these activities, Lynda still finds time to be involved in the Garden Club, the Help For Haiti committee, and she’s helped out in previous “Art in Bloom” shows at the Art Alliance. “We have an unbelievably artistic community here in Boca Grande – there are some really amazing artists,” she said. Lynda and Jim will be heading back north to “Old Town” Chicago at the end of April. They plan on spending some time at their cottage in the quaint, small town of Au Grey, Michigan, located on the shores of Saginaw Bay and Lake Huron. They’re also planning a phenomenal trip in May to Iceland and Scotland, where Jim’s family is from, so they’re looking forward to that. The Royal Palm Players are always looking for new volunteers, both on stage and behind the scenes. For more information on upcoming shows, visit royalpalmplayers.com.